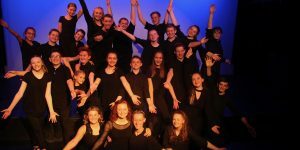 Teen Boot Camp (TBC) was designed to give teens an intensely memorable theatre experience. Now teens 7th through 9th grade can taste TBC through TBCjr. Think theatre school on steroids, and that is TBCjr. Come play… if you dare! Oh my! I love TBCjr to death. It is so fun and intense and at the end so rewarding. TBCjr is a great program that gives us kids confidence not only on stage but in real life as well. I really enjoyed TBCjr. It helped my acting and singing so much. Thanks so much for this experience! The best week of my summer! Registration for both sessions of TBCjr 2019 will open at 12:01a on January 1, 2019! These dates are set in stone. Participants may have no conflicts with TBCjr… it’s that intense!! Ages: You must be in 7th, 8th or 9th grade in the 2019-2020 school year. Cost: $150, no refunds for any reason. Auditions: You must be registered to attend these auditions. March 27, 4-6:30p. Come ready to sing, act and dance (you don’t need to prepare anything). The auditions are to help us design a show around the talent in TBCjr 2019. Classes: June 17-21, 2019 (8a-3p). Performances: June 22, 2019 (9a, 11a and 1p). Includes: T-shirt, dog tags, cinch sack, one week of class, 3 performances, and one amazing experience! Cast will include: 10 girls and 10 boys! Ages: You must be a GIRL in 7th, 8th or 9th grade in the 2019-2020 school year. Auditions: You must be registered to attend these auditions. April 11, 4-6:30p. Come ready to sing, act and dance (you don’t need to prepare anything). The auditions are to help us design a show around the talent in TBCjr 2019. Classes: July 8-12, 2019 (8a-3p). Performances: June 12, 2019 (3p, 5p and 7:30p). Includes: T-shirt, dog tags, cinch sack, one weeks of class, 3 performances, and one amazing experience! Cast will include: 20 girls! You register! (Don’t forget.. only 20 spots for each session!) On March 27 (Coed/June) and April 11 (for Girls Only/July) you audition for the Directors. Don’t worry! You are in TBCjr, we just need to see you because (the best part) the audition helps us create a show all around your specific talents. You don’t need to prepare anything! Just come and we will teach you a song, you will act out scenes and dance. May 17 (4p for TBCjr/5p for TBCjr: Girls Only!) you are given an amazing script. You then get all of your scenes memorized by the first day of TBCjr! 1 week of super intense theatre… you won’t forget TBCjr!